To use the Neti Pot, simply prepared the saline solution by adding 8 oz of warm water and a heaping 1/4 teaspoon of non-iodized salt to your Neti Pot. Then turn your head to the side, and insert the spout into the upper nostril. 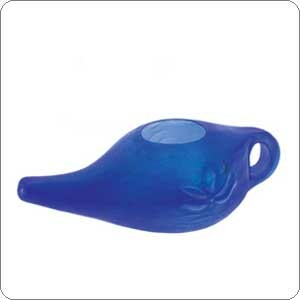 Raise the Neti Pot so the saline solution flows into the nose and out of the lower nostril. Full, detailed instructions are packaged with the Neti PotTM. For the perfect salt and to add extra immune support to your nasal wash, try our Neti Pot Salt and Neti Wash Plus. A leader in the field of yoga, meditation, spirituality, and holistic health, the Himalayan Institute was founded by Swami Rama of the Himalayas. The mission of the Himalayan Institute is Swami Rama�s mission�to discover and embrace the sacred link�the spirit of human heritage that unites East and West, spirituality and science, and ancient wisdom and modern technology.